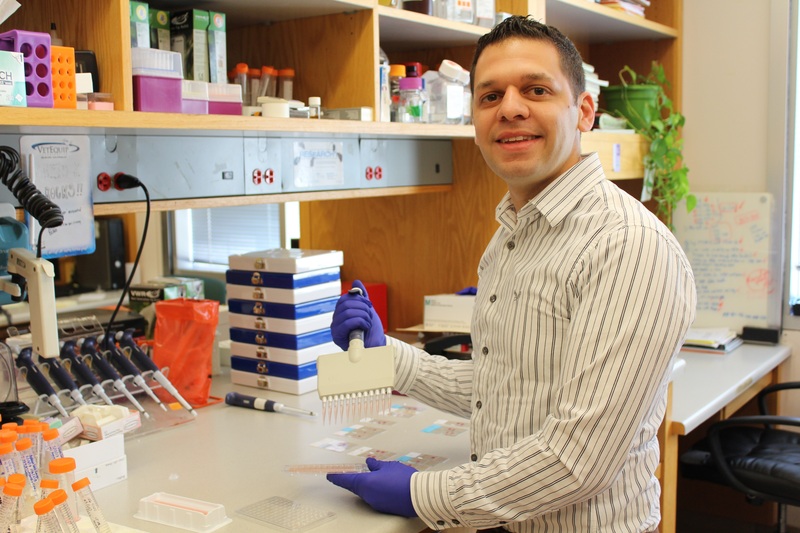 Juan Manuel Schvartzman, M.B./BChir, Ph.D., Memorial Sloan Kettering Cancer Center, in the laboratory of Craig B. Thompson, M.D. My work in the Thompson focuses on how mutations in an enzyme intricately involved in cellular metabolism affect the ability of these cells to specialize. Tumor cells rewire their metabolic pathways to ensure that they have adequate energy and nutrients to divide. However, tumor cells must also avoid the signals that push them to become more specialized, or differentiated, as differentiation is intricately associated with an inability to continue dividing. Interestingly, a subgroup of diverse tumors including leukemias, glioblastomas, cholangiocarcinomas and chondrosarcomas harbor mutations in enzymes that until now have been associated with how cells utilize nutrients for energy and building block production. In work completed in the past year, I have seen that cells with mutations in one of these metabolic enzymes, isocitrate dehydrogenase, are unable to differentiate. This is due to the fact that during differentiation, regions of the genome containing genes required for differentiation must be opened or made accessible. This process requires the function of enzymes that use metabolites to carry out this opening by removing certain marks (in this case histone H3K9 methylation) from chromatin, the complex structure formed by DNA and the proteins that surround it. In cells with IDH mutations, these enzymes are inhibited and hence cannot open chromatin in the regions required to differentiate. Hence, IDH mutations lead to a block to differentiate, a known step in the process of becoming a tumor. In addition, I have seen that by inhibiting the deposition of the mark that cannot be removed in IDH tumors (H3K9-methylation), the block to differentiate is fully rescued. This points to a potential therapeutic target of tumors whose driving force is the inability to differentiate. Dr. Schvartzman received his B.A. and M.B./BChir from the University of Cambridge and his Ph.D. from Cornell University. Rajesha Rupaimoole, Ph.D., Beth Israel Deaconess Medical Center, in the laboratory of Frank Slack, Ph.D. Lung cancer takes the number one position among cancer types with an estimated death of 160,000 in year 2015 in USA and records to have aggressive metastasis, with clinical resistance to existing chemotherapies. This warrants non-conventional treatment strategies based on novel therapeutic combinations. MicroRNAs (miRNAs) represent a significant advance in our understanding of cancer biology and have potential to become powerful therapeutics. One such miRNA is miR-34, a key tumor suppressor that regulate important oncogenes such as MET, MYC, and JAG1, while it’s low expression is a biomarker for poor outcome in NSCLC patients. To define the potential of miRNA therapy for non-small cell lung cancer (NSCLC), we began working with mouse model, with activated KRAS and mutant p53 (KP), which is more representative of human NSCLC. When we treated KP with mice with MRX34, a clinical grade nanoparticle formulation of miR-34, we observed significant stabilization of the disease. However, it was not sufficient to cause tumor regression. Current work investigates the synthetic lethality of MRX34 microRNA therapy for NSCLC, MRX34-sensitization of drug resistant Kras:p53 mutant NSCLC cells by targeting oncogenic miRNAs, if MRX34 treatment shows therapeutic potential in EGFRL858R ; p53, and erlotinib-resistant EGFRL858R+T790M ; p53 mutant mice, and to discover serum and tumor biomarkers in the Kras;p53 mutant mice treated with MRX34 that will be useful for PK, PD, and efficacy analyses in the upcoming clinical trial. Dr. Rupaimoole received his M.S. in Biotechnology from University of Texas, San Antonio and his Ph.D. in Biomedical Sciences from University of Texas, Houston. Christopher J. Pirozzi, Ph.D., Duke University, in the laboratory of Hai Yan, M.D., Ph.D. Gliomas are the most common malignant tumor of the central nervous system and have both an inherent tendency to progress to more advanced stages and a high propensity for recurrence following standard of care therapy. In their most aggressive form, the median survival remains a dismal 14 months. A lack of identifiable targets, a diffusely infiltrative nature, and an immunosuppressive microenvironment are contributing factors toward the therapeutic difficulties observed in patients with glioma. Advances in sequencing technology have made it possible to sequence the genome of an individual patient’s tumor, shedding light on the mutation spectrum of tumors and the identification of tumor-specific antigens. Our lab has previously identified the most common mutations observed in gliomas. 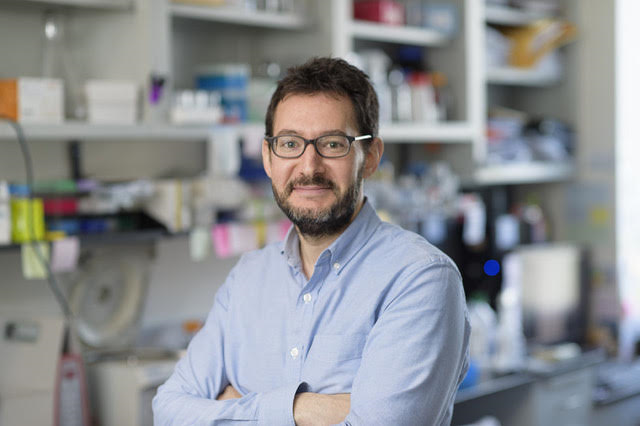 Dr. Pirozzi’s current work investigates how the immune system is impacted by the presence of different mutations, how the immune repertoire evolves over the development of the tumor, and seeks to identify T cell receptors that are specific for tumor-specific antigens. With an immunotherapeutic focus, the project aspires to develop adoptive T cell transfer therapies that will be specific for only those antigens present within the tumor itself, offering an ideal means of treating gliomas with minimal invasiveness and off-target collateral damage. Dr. Pirozzi received a B.A. in Genetics from Rutgers University and a Ph.D. in Pathology with a certificate in Developmental and Stem Cell Biology from Duke University.